When the first small demonstrations started to take place in March 2011, many Syrians imagined a genie eager to make their wishes come true. From media coverage of Tunisia and Egypt that romanticized the power of “the people” they got the impression that their personal aspirations and dreams will materialize when the magical Arab Spring tour train finally reaches Syria. Then you have the foreign policy “no Iran and no Hizballah” demands of the Syrian people, or the economic demands where “the Syrian people” either want more socialism and a better distribution of wealth (if you are a communist opposition leader), or “The Syrian people” want the country to have proper free market economy where business owners will be able to trade freely and where Saudi/Qatari/Turkish/American and European new allies will help build mega projects, if you are one of those rich businessmen I had dinner with 2 years ago. On the regime’s side one learns that “the Syrian people” are all happily and forever dedicated to the cause of “Mouqawama” … resistance. They eat and breathe resistance to American and Israeli hegemony, they want their country to continue paying the heavy price it has been paying for decades (since independence) standing up to any foreigner that threatens Arab independence and dignity. Turkey’s Prime minister and Qatar’s Shaikh Qaradawi told us, indirectly, from day1 that “the Syrian people” want the Muslim Brotherhood in power (with Bashar, initially, allowed to stay as a figurehead). Prime Minister Erdogan promptly organized a conference for Syrian opposition that was dominated by Brotherhood figures. He publicly threatened the Syrian President (his closest friend a week earlier) that he, Erdogan, is watching closely and will not allow Assad to fail to respect the wishes of the Syrian people. Qatar’s Qardawi on the other hand, said Assad is a great guy but, his regime is horrible and it must be replaced and reminded Assad that he always warned him that his people want him to work with the Brotherhood but Assad did not listen. Qardawi appears to consider his audience at the Mosque in Qatar a part of “the Syrian people” when he says “we want” or “we will not accept”. In other words, “the Syrian people” are merely a coherent part of the larger Islamic nation that has a stake in the change that must take place in Syria. The Syrian people want what the Islamic nation wants and they reject what it rejects. When Qaradawi spoke against the regime’s initial use of force against the Syrian revolution he said “These revolutions are peaceful, they do not carry a sword or a rifle … only carrying the Quran and only calling Allah Akbar“. Western governments and their media outlets that almost always promote policies advocated by spokespersons at the department of state, were adamant that what is happening in Syria is simply “The people” courageously fighting to topple Assad just like their predecessors in Tunisia and Egypt decisively rebelled and changed their dictators in a few weeks. Former French foreign minister Alain Juppe camped, for months, at the UN security council trying to get a resolution that would allow him to send NATO bombers to help “The Syrian people” settle their account with President Assad just like Mr. Juppe has an account to settle with him because Juppe’s mentor, Former President Jacques Chirac was humiliated by Assad after failing to topple him between 2005 and 2007. Similarly, American Ambassador to Syria Robert Ford felt he has sufficient justification to totally disregard diplomatic agreements and protocol when he went to Hama to support “The Syrian people” against their leadership. Two years have passed since the start of the crisis and neither the regime nor the opposition got to celebrate victory. Aside from the obvious fact that both sides have sufficient military strength to ensure they cannot be defeated with ease any time soon, the main reason neither side won this war is that millions of Syrians are committed to side 1 and millions more believe in side 2. Is it still necessary to conduct these popularity contests? Yes, absolutely. There are three main justifications for fighting and for rejecting dialogue/political solutions. 1) We are the sole representative of the Syrian people and we must defend them. 3) We will win soon … victory is near. I will discuss numbers 2 and 3 in future articles, but for now we must address and deal with the propaganda and/or delusion behind claims of full representation of “the Syrian people” (by all sides) before we can hope to start a process of dialogue/negotiations that will lead to a cessation of hostilities. While others are busy arming and fighting, those of us who genuinely want to shorten the current bloody dark tunnel that hopefully ends with dialogue need to rebuild proper foundation that was never built by those who rushed since March 2011 to change Syria according to the “Tunisia rules” … the Arab Spring stipulates that “the people” want to change their dictators, regardless of what country Spring strikes. Why complicate things? why question the two dominant narratives? 1) Because 750 days have passed since the start of the conflict and it is clear that both the regime and the opposition are still strong on the ground. Because we meet and read their supporters in large numbers anywhere Syria is debated. Because there are many Syrian cities that most neutral observers agree are clearly supportive of one side of the other. 2) The largest online polls (non-scientific, but significant enough) still show a split in the 40-60% range (either way). Here is TIME’s vote on Bashar Assad‘s inclusion in their 2013 edition of the annual “TIME 100 list”. At the time of writing this article the results were less than 10% against Assad and he received the 3rd largest number of supporting votes. I covered online polls in 2011 in detail in this article. The results also suggested a near 50% split in popularity. 3) Both the regime and the opposition always claimed “millions” supported them in nation-wide demonstrations in almost every Syrian city. However, it is evident that most Syrians do not know how to estimate size of demonstrations. The real numbers were far from millions in every case. Hama’s largest opposition demonstration was less than 30,000 and the regime’s largest demonstration in Damascus peaked at 100,000 to 150,000. Same holds for Aleppo and those were in 2011. Demonstrations in 2012 for both sides had considerably smaller numbers, perhaps because of the deteriorating security situation. I covered demonstration sizes in more detail in this article. Neither side has the right to claim that millions of Syrians demonstrated in its favor. – The largest opposition online hub is the Facebook page of “The Syrian revolution 2011“. It currently has about 775,000 members. The main pro-regime online presence is the main Facebook page of President Assad. It currently has about 396,000 members (about half the size of the opposition’s page). Yet, when one looks at the composition of those members, it becomes clear that Assad’s page has 55.4% of its members inside Syria while the Opposition’s main page has only 15.9% Syrians. The rest are from other Arab and non Arab countries, mainly Egypt, Tunisia, and Saudi Arabia. Another thing one learns by looking at the list of the largest and most popular Syrian pages on Facebook is that the vast majority of the popular pages have nothing to do with politics. Although those of us who are passionately trying to be active in shaping Syria’s future spend our time reading and commenting on politics, most Syrians on Facebook seem to be playing online games and following pop singers. 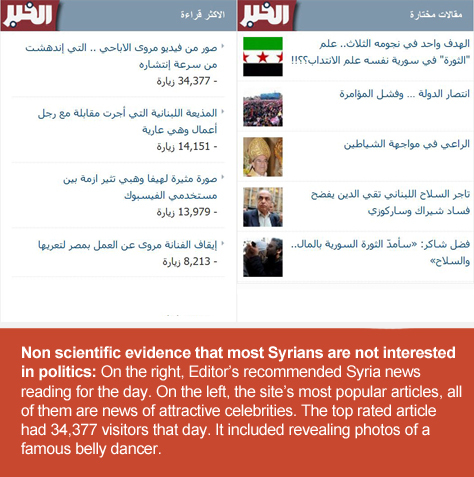 We assume that all Syrians share our interests, but they apparently do not. The first time Egyptians went to vote for President after they toppled their authoritarian leader, Hosni Mubarak, they voted 49% for a Mubarak former minister called Ahmed Shafik. A man with no charisma who was so bored with his own campaign that he almost fell asleep days before elections were held while he was answering questions at a TV program. ُHow can that be consistent with what we were told that “the Egyptian people” were united in revolting against their former regime?. Egyptians also mostly stayed at home when they were called on to vote for a very controversial constitution that was proposed by their Islamist President. 68% did not feel like voting. I’ve always proposed that we are making a serious mistake when we assume that the most vocal and active Syrians during this crisis represent the attitudes and beliefs of the population at large. 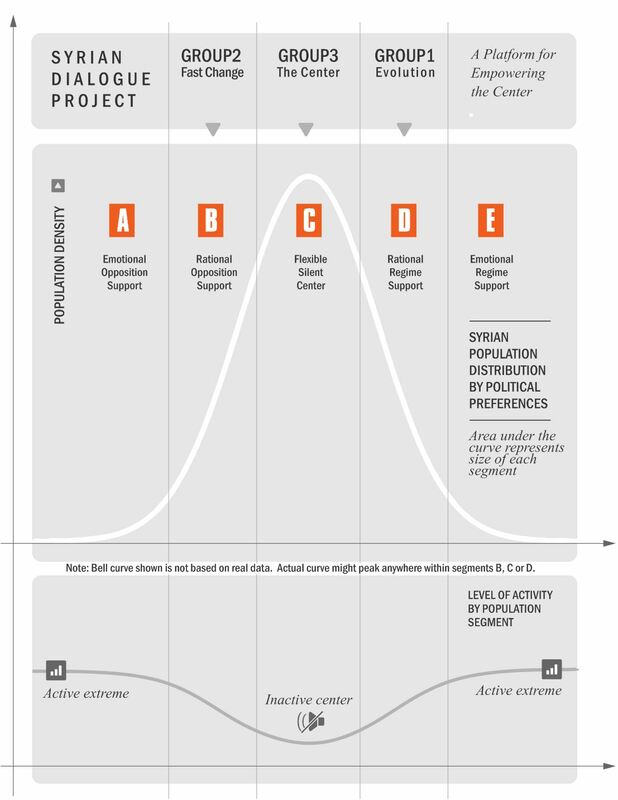 A bell curve distribution that might or might not be skewed to one of the two sides is probably what describes the distribution of Syria’s population along the political spectrum. Here is what I am suggestion is a more useful plot that describes that distribution. Finally, a quick lightweight example (just another example, nothing scientific) of why we might be making the wrong assumptions about “The people”. The editors of a popular Syrian website listed for their readers the editorial board’s recommended pages/articles for the day. That list dealt mostly with Syria crisis related political topics. Next to it, there was another list, the list of actual top, most popular, pages that the site’s readers actually opened. Those were all promising through their titles interesting stories about attractive belly dancers or actresses. 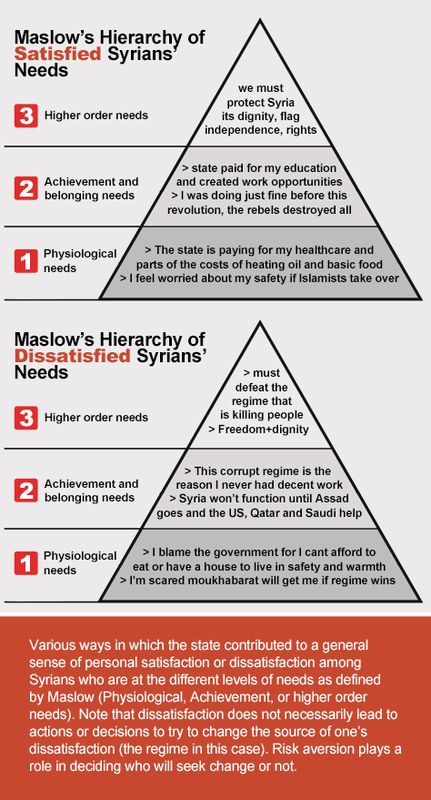 No one can present a precise estimate of the number of Syrians that support, or oppose the regime but taking a look at Maslow’s hierarchy of needs (as one of many possible frameworks for anchoring a complex analysis of the motivations of “the Syrian people”) will hopefully help better understand that all the narratives put forward by all sides are simplistic, propagandist and unrealistic. The purpose of this exercise is not to reach an estimate of popularity of each side. Instead my hope is to try to convince those who concluded that their side has near monopoly (or 80%+) on SOLID support to reconsider. 1) Support does not appear to belong exclusively to one camp or the other. 2) Support is not always solid and absolute, but varies considerably in its intensity. It is not an ON/OFF variable. Higher order needs humans start seeking a role to play in helping some higher order cause; world peace, their country, their sub-group, inter-racial harmony, the poor, the environment, the underdogs …). This theory states that once a need is satisfied, it stops being a motivator of human beings. Let us look at satisfaction levels of Syrians away from the often misleading classification by religion or economic assets. For each of the three levels of needs, we will look at why we can find both regime supporters and opponents. Within this most basic level of needs Syrians dissatisfied with the regime can be found among those who openly supported the revolution by donating money to the rebels or by taking part of demonstrations or by engaging in online fights with regime supporters. They would not feel safe if the Syrian army defeated the rebels and if the regime “won”. They feel they would be physically punished. Similarly, many Muslim fundamentalists in general, even including those who did not express their hate of the regime in public, they see the army and security as violent sectarian forces and therefore they consider them hostile enemies. They will only feel safe and secure when Syria is led by a regime that embraces conservative Islam. The manner in which Rifaat Assad’s troops dealt with the Muslim Brotherhood’s violent uprising in Hama and Tedmor prison (combined estimate of 12,000 casualties) in 1982 left a long lasting sense of insecurity among many conservative Muslims in Syria. It should be noted that for years Bashar Al-Assad did try to establish friendlier relations with religious fundamentalists in Syria as this popular Saudi cleric testifies here “the regime’s tolerance is surprisingly better than most other [Islamic] states”. Syria’s security agencies however, continued to instill fear in the hearts of Syrian Islamists. Perhaps not fear for their lives, but fear of arrest and some form of physical torture. After the start of the conflict in late 2011, the high death toll in addition to Security forces’ frequent humiliation and beating of many of those they arrested during the current protests opened old wounds and reinforced fears. The regime failed to demonstrate its determination to punish those behind the many cases among security forces who acted above the law. On the other hand, Syrians satisfied with the regime among those mostly occupied with their physiological needs could be found among minorities, women and some secular Syrian Muslims who are worried about their safety if Syria follows Iraq’s example or even Egypt’s example. Minorities in those two countries feel less secure and less free in post-Saddam Iraq and post-Mubarak Egypt. The Syrian regime’s most committed supporters can be found in this segment. Women, religious minorities, or secular Muslims who perceive a high probability they will lose some of their basic rights if the revolution, led by religious fundamentalists in their view, controls Syria, will often decide that the regime is still the option that will ensure their physical safety if they are to maintain their previous lifestyles which they highly value. As the crisis continues to be beyond the regime’s ability to control, many initial supporters of the regime are losing hope and embracing change as they conclude that the regime is not able to sustain Syria’s legendary stability and safety anymore. The revolution’s supporters (or manipulators) intentionally or subconsciously sought destruction and chaos as they realized this will help them destroy one of the main pillars of regime support … the perception that the regime is better at protecting people’s lives and satisfying their physical needs for survival. The strategy paid off for the regime’s opponents but it recently started to backfire as many Syrians who initially supported the revolution started to blame it for their misery. Finally, despite the popular impression that this is the revolution of the poor, many of the poorer Syrians are still regime supporters because they value the socialist state’s food and heating fuel subsidies and free medical care. Recent news that Syria was on its way to reduce or remove some of those subsidies led to widespread dissatisfaction among those who rely on those subsidies to survive. The Baathist socialist regime that stared to adopt western inspired economic reforms lost many, but not necessarily a majority, of its traditional supporters among Syria’s poor. Before the start of the crisis, Syrians falling under this category of needs were perhaps a majority, what some might simplistically call “The middle class” which is not true. since many rich still did not develop higher order needs beyond their need to grow and score more personal achievements. This segment included those who were not too concerned anymore about their physical survival but were more concerned about higher education, successfully growing their small business, or being able to acquire status symbols … consumer items that became abundant in Syria after decades of economic austerity, or perhaps being able to attract a trophy wife after accumulating sufficient wealth and educational credentials. Among the Syrians who felt the state contributed to their dissatisfaction are those who blamed corruption or economic mismanagement for their failure to progress in their careers or to grow their businesses. “In Syria, you have to be a partner with Rami Makhloof [the President’s cousin] if you want to get anywhere”. Some of this perception is justified, some is exaggerated. But regardless, the perception of level and source of corruption is what affects people’s conclusions. The regime lost the satisfaction of many Syrians with achievement needs even among those who opposed the revolution at first, as they started to conclude that western and GCC countries will never allow the current leadership to succeed in rebuilding Syria’s economy and therefore there is no choice but to let them go and accept the ones that the west, Turkey and Qatar want to work with. Similarly, many Syrians who initially supported the revolution concluded that the real leaders of the revolution are chaotic, uneducated Islamists who will never be able to run the country and to help generate jobs and business opportunities. They also realized that the promises of the revolution to improve their chances of competing fairly in business after they remove the Rami Makhloufs of the regime paled in comparison to the devasting destruction to the economy that the revolution, some blame, for leading Syria into. The revolution, therefore, lost some of its initial pragmatic, middle class supporters who are preoccupied with their growth needs. Among the satisfied Syrians in this category are to be found mostly in the largest cities of Damascus and Aleppo where economic reforms created many opportunities for growth that were not possible in the past. Outside Damascus and Aleppo however, there was less uniformly distributed evidence of such progress. Western reporters and opinion writers who could not control their urge to turn into activists supporting the idealized image of the revolution that they decided to form, after reporting Egypt and Tunisia, usually negatively portrayed “Sunni” regime supporters in Aleppo or Damascus and described them as being selfishly more interested in protecting their own personal achievements that the regime helped them through, while failing to support the revolution’s “freedom” demands. Personal achievement can be felt through education. Many Syrians are thankful for free education. In the United States the cost of going through college education might reach hundreds of thousands of dollars. In Syria it is paid by the state. Some take it for granted, others who considered the option of studying in the United States realized the value of free education in Syria. You can find regime supporters who are originally from a poor family in the countryside among those who still feel indebted to the state for paying for their education which helped them fulfill their achievement needs that would have been difficult to achieve without the state’s help. Syrians with higher order needs are those who already satisfied their physiological needs as well as their needs for personal achievement. They seek a fulfilling role to play where they can help their country, humanity, society, religion (dogmatic), spirituality, peace-making, the environment, or other non-material interests. This is the group of Syrians that supplied many of the heroes and villains of the crisis. Some played small roles (positive or negative). Others played more leading roles that sadly, mostly contributed to widespread anger, hate, fears, sectarianism and ultimately to bloodshed and destruction. Good intentions are not always real and even if they are, they do not always translate to constructive contribution from those who cared about their country or their people in this crisis. Regime opponents among these types include those who are fighting for political rights, freedom, democracy and dignity for all Syrians. There are liberals and idealists, young and old Syrians who fought for years to achieve these goals. Some were frequently arrested and jailed, others lived in fear while they blogged against dictatorship, torture and lack of freedom of speech. A considerably larger number of regime opponents among Syrians who had non-personal higher-order needs were to be found among the Islamists who dedicated their lives for promoting Islamic governance of Syria and the Arab world. They wanted to liberate their countries from all secular leaders. For them “freedom” is their freedom to chose Islam over secularism. Among the active younger Islamists, there are many who attended training next to secular activists and bloggers of their age when they attended seminars, conferences or meetings organized (directly or indirectly) by western democracy promotion NGOs. They often acquired some degree of genuine appreciation to western style democracy and freedoms. I had discussions with many of them over the years and it is clear to me they are confused and undecided which set of often-conflicting moral values they wanted to promote … western liberal freedoms or Islamic rule. These are not dissimilar to the Islamists who participated in toppling Mubarak but then started to clash with their liberal former allies in that struggle. The regime had its good share of support among Syrians who were motivated more by non-personal and non-material values and causes. Before March 2011, most Syrians were happy with their country’s role in the Middle East and their leadership’s positions and statements. They liked Syria’s support to the Palestinian cause and to Lebanese and Iraqi resistance to foreign occupation by Israel and the United States. There was pride that Syria was the only Arab country that was independent in its decision making. Syria never accepted American dictation and it was the only non-oil-rich country to not have foreign debt. President Bashar Al Assad was voted at or near the top of Arab popularity polls in recent years. President Hafez Al Assad before him was considered the most powerful, intelligent, balanced and wise of Arab leaders. Syrians respected his ability to lead the country, protect its interests and defend its causes as well as other Arab causes. He was ruthless, but genuine in his nationalism. Syria was the prefect Arab country to provide real pride and fulfillment for those who love their country to be strong and just. When the revolution started, there was an immediate campaign to discredit the leadership and to dismantle its base of support. Stories were circulated claiming that Hafez Al Assad sold the Golan Heights to Israel, that Israel is backing Bashar Al Assad today, that Iran controls Bashar Al Assad like a puppet, that Nasrallah control Bashar Al Assad, that the two Assads were making deals with the United States and backstabbing the Palestinians. However, Syrians who were motivated by secular causes mostly remained strongly committed to the regime until today. They are upset at the regime’s failures in handling the crisis but they have no doubt that the international conspiracy is also to blame for all the bloodshed and destruction. On the other hand, the regime lost the support of many who felt that nothing will satisfy them anymore after all the bloodshed by the state. The regime also lost Islamists who used to tolerate it only because they liked its alliance with Hamas, Hezbollah, and Iran against Israel and the United States. They used to believe the regime was more of a useful ally to Islam’s causes than the pretentious Saudis and Egyptians. But the struggle against Israel seemed to be taking too long. The Americans were already defeated in Iraq. There was nothing the regime was expected to deliver in the near future. When the Tunisians and Egyptians succeeded in toppling their secular leaders, they achieved sweet success within weeks, not endless decades as in the case of fighting Israel. Syrian Islamists who previously supported the regime quickly deserted it and found a much more likely victory in converting Syria to the next link or partner in the new regional Caliphate they always dreamed of forming. Defeating Israel can wait until they form their Turkey-led Islamic Caliphate. Similarly, many previously secular young and old Syrians who were not too preoccupied with work or education, also turned to Islam for similar reasons. Everyone loves being part of a success story that the whole world watches in awe. This is not unlike participating in Parades in the street of Cairo, Beirut or Damascus with Brazilian or German flags after one of those teams won the soccer world cup. Western and GCC media played a major role in turning previously secular Syrians into Islamists by portraying (at least initially) Islamist rebels who joined the Free Syrian Army as freedom fighters … heroes. Those who had higher order needs could not ask for a more fulfilling role to play than the role of a hero fighting for his country’s freedom and his religion’s nusra. Before the crisis such young men had to manage by helping the elderly or by donating blood perhaps at the local red crescent center. In the past, other Syrians had their higher order humanitarian needs satisfied by their government each time Syria welcomed hundreds of thousands of refugees from Palestine, turkey, Iraq and Lebanon. Many Syrians were also proud that their leadership was the most protective in the Arab world (besides Lebanon and Tunisia) of minority rights as well as women rights. Those who valued Syria’s coexistence can be found today among both camps. You can find Sunnis who side with the minorities supporting the regime mostly because they care the most about supporting and standing by their fellow Syrians who come from non-Sunni families. Also you will find Alawites and Christians siding with the revolution, or even with Islamists because they highly value their ability to think about religion in an open minded manner. Many Kurds, especially in north eastern Syria want nothing more than an independent Kurdistan. Their higher order needs are very specific. Syria started to address Kurdish needs before protests started to take place in Mid March. Iraq’s Kurdish President, Jalal Talibani, visited Syria and met with its Kurdish leaders and urged them to be good to Syria for all the help and protection the country provided them for decades. This was followed by granting Syrian nationality to tens of thousands of Kurds who immigrated to Syria from Turkey during the 1960’s. Protests in Kurdish regions disappointed protesters elsewhere for being much weaker than expected. The Arab spring’s winds of change affected many in Syria. While it might have been true that most Syrians were not overly concerned with political reforms in the past, now many insist on those reforms. They want real progress before they are interested again in supporting resistance to Israel and the United States. Despite the obvious role outsiders are plying in the crisis in Syria today, many Syrians are not interested to hear “excuses” that they feel the leadership is using to avoid political reforms that many people are demanding. Similarly, the revolution failed to impress many of those who believed in idealistic, peaceful change. Sadly, at this stage, there are no leaders, institutions or ideologies that unite a majority of Syrians seeking fulfillment of their higher order needs. Revolutions always raise expectations by implying “The people” demanded change and there is therefore every reason to expect the people, all the people, will be delighted with that change. The Syrian revolution is no exception. But the revolution/conflict is much more complex than the Sunni vs Alawite, poor vs rich, rural vs urban, patriotic vs traitor, free vs oppressed simple narratives that it has been reduced to. These simplification were formed through delusion, naivety, laziness, or carefully constructed narratives by propagandists from both sides who continue to find them useful to justify their exclusive claims to power. While we will not really know exactly how much support each side has, we should not continue to assume that “The Syrian people” want exactly what we want. It is perhaps the mother of all deadly assumptions that helped fuel the Syria crisis. Indeed I have learned from this post, thank you. The first thought came to mind after reading your post was that there are social, religious, economical, and political challenges in every country on this planet, and base on the Maslow’s there should be a bloody revolution in every single country including Switzerland! So how are the governments of these countries managing to suppress these revolutions?! Syria was on its way to be economically sound in the area that was the trigger to the lucrative creative chaos. Yes, it is envy after all one of the 7 sins! LOL…Chairman Mao, the greatest mass-murderer in history. He was an atrious psychopath responsible for forceful collectivism and death of millions under a rigorous police state. I support Assad against the rebels but this type of attitude of portraying Mao and other murderous leftists by the Syrian population must stop. That was a well informative and bias read. I’d like to discuss with you more in the matter in be more open-minded than what the media here in the west have portrayed me, but I have a few questions first that you have somewhat answered in a nonchalant way. Your perception of the rebels are basically what everyone else perceives of the satisfied Syrians in Syria, greedy and only interest in their own business affairs. When only two cities are prosperous out of the whole country, this long totalitarian government of decades is obviously doing something wrong, not doing what’s right for the people. Your article also gave off a very condescending lead that has lead me to assume that you’re bias towards the rebels. How can you support a president that kills off his people, supports terrorism, and has a regime that is so brutal it can lead to the next genocide in the Middle East. an outstanding study for the Syrian crises. it is stunning article from a highly professional. exceeds anyone expectations. I read the article both in arabic and english it carries the deep yet neutral analysis of the issue. thanks to the Camille and my extend thanks to the people worked on the translation. Thanks for this excellent and much needed article, probably one of the best I’ve read on why today Syria is where its at. It addresses the very issue at heart in this conflict which for some funny reason hardly anyone in the media cares to talk/write about – what future do the Syrian people collectively want for themselves? The post nicely outlines the web of internal divisions and opposing near term aspirations of the Syrian people, which interwoven with foreign interests using Syria as a pawn in their long game, must surely feel like a Gordian Knot to anyone trying to envision a still united Syria once the dust of civil war has settled. It also underlines how difficult it is to estimate the number of political camps within Syria today, let alone the percentage of Syrians in each camp. I suppose only fair and square elections can determine those numbers, but have strong doubts that within the foreseeable future the entire country will be at ease enough to allow for this to happen. I can only hope the final call on who and what political system will govern the country will be made exclusively by Syrians who actually live there. Maybe cooler heads within the various factions will prevail and enough common ground can be found for a grand compromise, grand enough to provide a power and wealth sharing structure that will keep the country united and hence strong enough to stand up for itself and all its territorial rights. This is a point that people are missing and is much needed, and I am so glad to see that someone has published an article about it. Living in the west, I know exactly the assumptions people can make about what the Syrian people really want. Most people here listen to the media (often filled with propaganda) and base their assumptions off of that, concluding that they now know what the Syrians want. And most of the time, they conclude that the Syrians want the regime to fall, because that’s the idea the media is giving. And yet the people do not all support the revolution. Nor do they all support the regime. Because, like in any nation, each person wants to see something different change in their society, each person has different goals. Like you said, this revolution is more complex, because it is both a media and actual war. The media can do a lot of harm. I do hope people everywhere will stop making assumptions, and once again, thank you for writing this article. Hopefully people will read it with more of an open mind this time around.